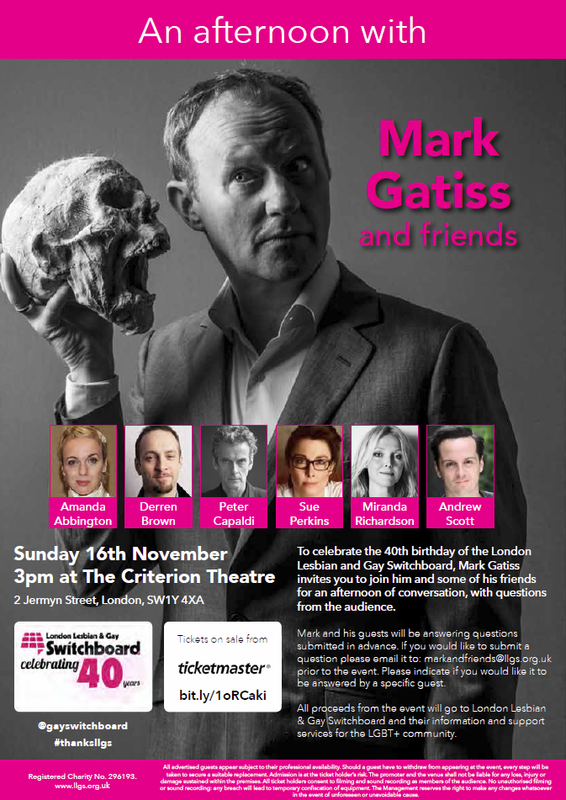 I’ve just got home from spending an afternoon with Mark Gatiss and Friends. 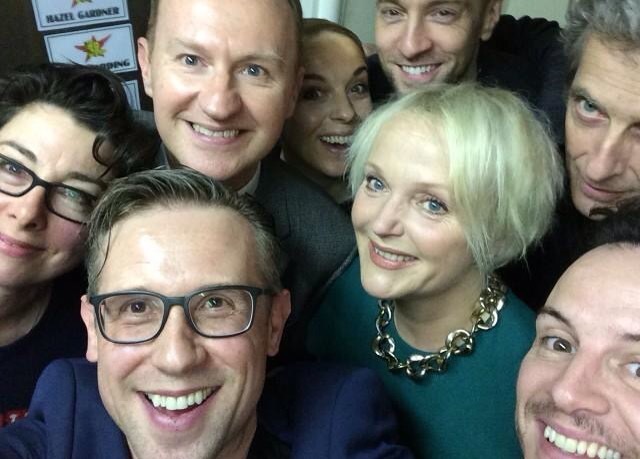 The Sherlock star hosted the event in aid of the London Lesbian & Gay Switchboard, of which he is patron. And what friends! The Doctor (Peter Capaldi), Moriarty (Andrew Scott), Mary Morston (Amanda Abbington), Queenie (Miranda Richardson), Sue Perkins and Derren Brown. Andrew Scott was asked if there was any point in him continuing to deny Moriarty will be in Sherlock season 4 as it’s on IMDb. He replied ” well if it’s on IMDb then absolutely not!”. Amanda Abbington revealed her character in Mr Selfridge, Miss Mardle, was originally going to be a lesbian but the ‘powers that be’ wouldn’t allow it. Obviously one of the big draws of the afternoon was the presence of Capaldi and, as always, he was charming and sweet. He says his life hasn’t changed that much since playing the Doctor – he still does the shopping and has to get his car MOTed! He said the thing he’s noticed he most is that he’s met with so many smiles, people are so pleased to see him. Capaldi said he didn’t get too caught up in the overarching themes of the last series “I operate on a need-to-know basis” he said. “I concentrate on scenes rather than an overview of the whole thing. I have ideas of my own about the internal life of the Doctor, but I keep those to myself”. Away from Sherlock and the Doctor, the panel were asked if they had a favourite musical. Andrew Scott revealed he’d love to be in a musical but he can’t really sing! Capaldi said he likes Blood Brothers as it’s very British. Gatiss announced his favourite is Carousel – which then became a the,e throughout the event. Another question was “do you have anything left on your bucket list?”. Capaldi said “my ambition at the moment is to not regenerate for a while”. One of the most interesting questions was what figure from history would Capaldi like the Doctor to meet? He’d obviously thought about this before as he immediately answered “Martin Luther King. I don’t see why the Doctor shouldn’t be involved in the civil rights movement”. Gatiss said he’d certainly be interested in writing a script for that but “you have to be careful about the tone of the story. It would be a big challenge”. One of the final questions was if any of the panel had any funny stories from set. Capaldi revealed he was once punched in the head by Brian Blesssed! It was when they were filming Tom Jones and the Doctor Who star needed nine stitches! “I came round” said Capaldi. “And I wasn’t wearing a wig,p and I remember hearing one ambulance guys saying ‘get his wig off’ and I kept saying ‘no, it’s my own hair!'”. Finally, one of the highlights of the afternoon was when Sue Perkins was talking about putting on a production of The Hobbit whilst at school. She advised the audience member to always know your limitations and not to be too over ambitious. Gatiss then retorted about how The Hobbit goes on to ages these days. That got a hard stare from Amanda Abbington! And a big laugh from the audience! So that was my afternoon and it was a very enjoyable one! The LLGS filmed the event and it should be on their site soon. And the charity will be hosting a special online auction later this week and Andrew Scott has donated his suit from Sherlock!